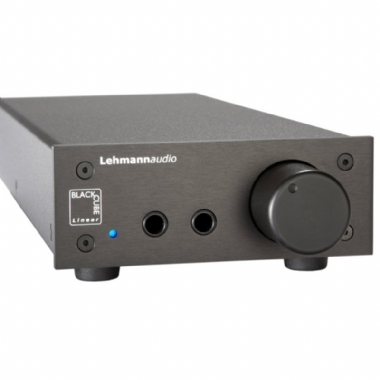 Lehmann Linear Headphone Amplifier - A high quality headphone amplifier is as important for listening to music with a pair of headphones as are stable power amplifiers for the loud-speakers of your stereo setup. Dynamic headphones are far more different than most people realize. For the same sound pressure level the power needed with different headphone models can vary up to a factor of about 500! Impedances can be different to a factor of more than 20! Carefully selected top notch components and a highly sophisticated circuit design guarantee top notch listening pleasure. Now you can hear that ultra transparent sound and the explosive dynamics formerly known only from electrostatic headphones. An overdimensioned power supply with a huge magnetically and statically shielded toroidal transformer is included internally allowing a power cable of your choice to be directly connected to the unit. The faceplate and the massive milled aluminum knob for the smooth running 27mm ALPS high grade volume control are available in anodized black or silver. To to get the best out of your headphone you will have to try the Black Cube Linear.